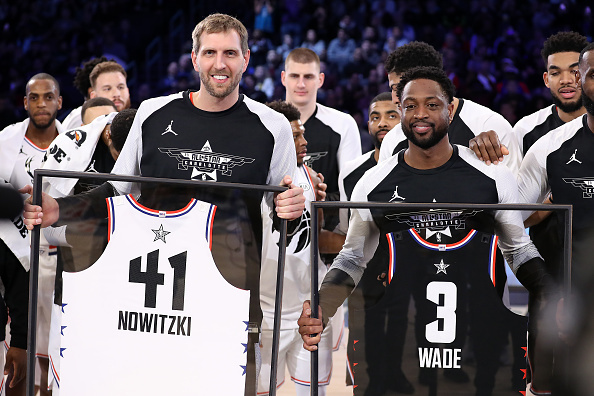 Two Hall of Fame careers came to an end last night in the NBA, as Dwyane Wade posted a triple-double in his final game with the Miami Heat, while Dallas Mavericks-lifer Dirk Nowitzki double-doubled in San Antonio. Both players were greeted with emotional video tributes on their way out the door and received praised from countless NBA superstars past and present. Among them, Kobe Bryant, who took to twitter to share his congratulations while welcoming both legends to "The Rocking Chair Club." In regards to D-Wade's #OneLastDance, Kobe tweeted, "Congrats on a GREAT career @DwyaneWade Way to close it out in style my brother. Welcome to the rocking chair club." The Black Mamba posted the following for Nowitzki: "Playing an entire career with one organization is a testament to who you are as a person @swish41 I loved and hated competing against you. Enjoy retirement my brother you deserve it #rockingchairclub"
Wade closed the book on his 16-year career with 25 points, 11 rebounds and 10 assists at the Barclays Center in Brooklyn, all while LeBron James, Carmelo Anthony and Chris Paul watched from court side. Wade, a three-time NBA champ and Finals MVP (05-06), averaged 22 points, 5.4 assists and 4.7 rebounds over the course of his career. Nowitzki, who spent each of his 21 seasons with the Mavericks, finished with a team-high 20 points and 10 rebounds in his final outing. For his career, he boasts per game averages of 20.7 points, 7.5 rebounds and 2.4 assists with a championship ring and an NBA Finals MVP from the 2010-11 season. article, Kobe Bryant Welcomes Dwyane Wade Dirk Nowitzki To "The Rocking Chair Club"